Remote control (RC) boat measures about 17 inches long and is great for pools, ponds, lakes, and the bay too. Reach speeds up to 25 MPH in this remote control boat with deep V hull and get all the fun of a gas RC boat without the fuel! Remote control Waverunner with twin fan cooled motors provide awesome speed and power for all types of water and saltwater too. Remote control (RC) submarines are lots of fun whether playing in the pool, bathtub, or fish tank too. Mini RC submarines are a great choice for aquariums. Explore the depths of the waters with remote control submarines. 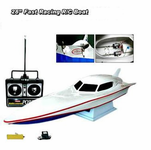 Check out the largest selection of remote control boats, advanced RC boats, and toys for sale.